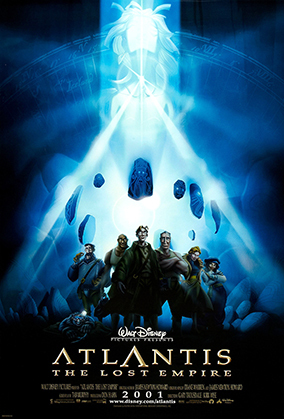 Atlantis: The Lost Empire is an old fashioned adventure that tips it’s hat to the great stories of Jules Verne – complete with wonder, humour and heart. The animation is dazzling, the musical score by James Newton Howard is quite rousing and the voice work is fantastic, with Michael J. Fox, Leonard Nimoy and James Garner all in top form. Look, I love what this adventure feature is doing because I’m a big Jules Verne fan and big, honkin’ fantasy adventures filled my childhood. This is just a great deal of fun – it gets the job done, getting in and out with its brisk running time. If I had any complaints, it would be that the characters aren’t really all that developed or particularly interesting. I mean, they are developed enough to establish what their desire and aim is and the love interest is sweet but I feel it could’ve been developed more. Instead, it leaves me wanting. This aside, there’s fun to be had here with this effort and if you’re like me, you’ll have a goofy grin on your face as this film captures the spirit of the old adventure tale quite well.